We were leaving Las Vegas behind in the dust early this afternoon when we heard the sad news that Charles Nelson Reilly has died. Kendall and Charles were very close; Charles always jokingly called her his fiancée. It’s hard to believe that he’s gone. Charles was every bit as funny in real life as he was in his endless game show appearances. And such a kind, caring man, whether he was bantering with Johnny Carson or schmoozing with a nurse’s aide. God, it was so much fun to be around him. Kendall could almost be considered a “Match Game” Love Child, not just because she watched the show growing up, but because she was so closely connected to the participants. 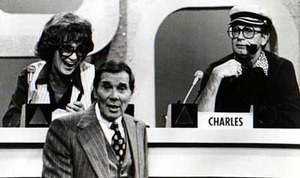 Charles’ sparring partner, Brett Somers, is Kendall’s godmother, and as far as I’m concerned, Kendall’s biggest claim to fame was when Brett wrote “Happy Birthday Kendall” on one of her “Match Game” cards and held it up to the camera, prompting a discussion of Kendall’s birthday with host Gene Rayburn. We recently saw this episode on the Game Show Network. In my opinion, some of the best comedy in television resulted from the impromptu antics of Charles and Brett on that show. They got away with a ribald repartee that would never be allowed on network television today. Charles was Kendall’s constant companion when she was in her 20s and there’s a great photo of the two of them dressed up as if they are going to a high school prom—Kendall in some ghastly taffeta that Charles borrowed from the costume department while he wore a bad toupee and a frilly-shirted tux. Kendall used it as her Christmas card that year, confusing her Texas grandparents who wondered why her “boyfriend” seemed so much older. Charles was renowned as an acting teacher, in New York, Los Angeles, and elsewhere. He spent years teaching at the HB Studio, the acting school created by Herbert Berghof and his wife Uta Hagen. Many of his students went on to have fantastic careers and win Oscars and other awards, including our just-seen Liza Minnelli who worked with Charles when she was young. Kendall was directed by Charles in two plays and she loved working with him. My first childhood memory of Charles was as the character Claymore Gregg on the TV series “The Ghost and Mrs. Muir” with Hope Lange and Edward Mulhare. 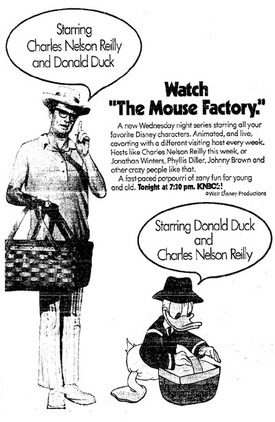 The show ran from 1968 to 1970 and was one of my favorites. I believe Charles remained friendly with Lange until her death several years ago. I also remember Charles from the freaky Sid and Marty Krofft series “Lidsville” that ran for two years in the early 70s. This show was later accused of using frequent drug references, including in the very title, and indeed, it’s probably best viewed while high. Charles played a villainous magician, Horatio J. HooDoo, who tormented protagonist Mark (played by Butch Patrick, the former Eddie Munster). Don’t tell me that the person who came up with the idea of a show takes place in a land of living hats wasn’t smoking something! Of course Charles also guest-starred in a million other popular sitcoms in the 60s and 70s, from “Car 54, Where Are You?” to “Here’s Lucy” to “The Doris Day Show,” and he was always the highlight of the episode. Funny that I was just writing about Don Rickles, because Charles appeared on many of the same talk shows and celebrity roasts. 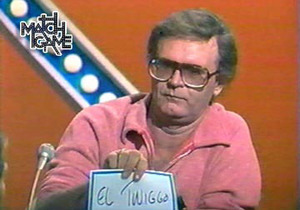 His “Match Game” reign began in 1973 and continued for years and years. Charles once said in an interview that “when I die, it’s going to read, ‘Game Show Fixture Passes Away.’ Nothing about the theater, or Tony Awards, or Emmys. But it doesn't bother me.” I haven’t seen any obituaries yet but I know he’ll be remembered by many for the full breadth of his amazing career. I have many fun memories of Charles Nelson Reilly and his wonderful longtime partner Patrick including watching Charles hold court in our backyard during our wedding reception three years ago this week. I remember once when my brother-in-law was in town mixing a Wilco CD, I think it was “Summerteeth,” Jeff was a big fan of Charles’ and asked us to bring him to a session. Charles walked into the recording studio and the hipsters hanging out there immediately were held sway by his endless anecdotes. Someone had a CD called Full Nelson Reilly by a band called the Didjits and Charles signed it for Jeff, “From one rock star to another.” On another evening we organized a dinner at Orso’s and it was a Charles Nelson Reilly-Jeff Tweedy lovefest throughout. I remember that the actress Sylvia Sidney was there that night and we stopped by her table as well. Oy, what a crazy world. She died a few weeks later. Charles, we will miss you so much, and just so you know, Kendall will always consider you her true fiancé! I always loved him. As a friend. As a kid. Oh, you know what I mean. We loved this man. He was our Master Acting Teacher during my apprentice year in Jupiter, Florida. Always funny, always supportive, always loving. I, along with every other student who was lucky enough to sit and work in his acting classes, will miss him dearly. Charles Nelson Reilly was a legend. I always watched him on the game show "Match Game" and "Hollywood Squares". He was the funniest man on the planet. He brought a smile to many faces during his career, and he will be missed. I too knew Charles from Jupiter Fla, he would come to the drug store I worked at to buy a newspaper etc... He would come in for a few minutes and he would have you laughing for the rest of the day. I remember one time my grandfather was there at the same time, I said "Mister Reilly, I would like you to meet my grandfather, Bill" and he responded,"Why, is he someone famous or something?" That happened over 20 yrs. ago and we still laugh about it. His memory and laughter will continue on. ^ very funny story Kathy. 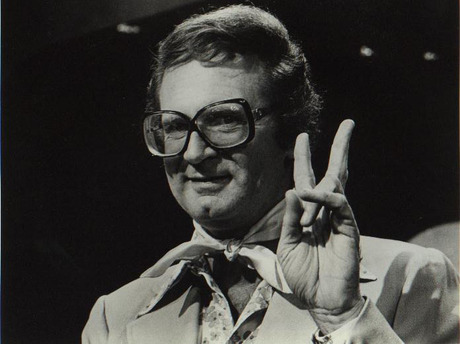 I will miss the genius that was Charles Nelson Reilly. I really will. We'll never see the likes of him again. He was so his own man. He will truly, truly be missed. I loved Match Game as a child. I wanted to be on that show so bad I think I actually wrote the tv station a letter. Lucky you for knowing such a legend. May he rest in peace. "Goodbye Brett and thanks for the memories"
And Charles, THANK YOU for the memories. You will be missed. What a funny guy, and what a good sport. I think it's great you guys had such a close connection to him. I saw his Obit when I opened up AOL this morning...I was shocked, and yet, I knew from you and Kendall that he was terribly ill...What a dear talented man Charles was...In EVERY way! He could 'play' anything! And he was such a sweet and funny man. I first met Charles around 1968....He was unforgetable, in every way. I remember one evening in particular back in the day, at a party...His mother was there. It was a true revelation and terribly funny and sad, ALL at the same time. I'm so sorry for your loss dear Kendall and Danny....This has been a very hard year for The Hailey Family, I know....Big Hugs To All Of You. This was a BEAUTIFUL Tribute, Danny....Gee, I hope that Documentary will be available on DVD...! I'm the Marie (La Virgina as he called me)from Sullivan Street in the Village and Charlie was Uncle Charlie From Broadway to my kids. He was part of our family for many years and he loved my mom, Josie his landlady, dearly. She fed him daily and watched over him and I'm sure she met him when he crossed over with a plate of pasta. Very often, he sat in the middle of our family arguments and never forgot a thing we said - only to hear it come back to us years later and on TV no less! Will miss you, old friend. HI! I HAVE A GOOD COMMENT ON BROADWAY WORLD.COM ON HIS OBITUARY PAGE UNDER "THE GHOST AND MRS. MUIR AND CHARLES NELSON REILLY" BY DONNA GREENCROSS,I THINK EVERYONE WOULD ENJOY. I CROSS TELEVISION AND BROADWAY AS A HOBBY. I WROTE AN ARTICLE LAST MONTH ON THE GHOST AND MRS. MUIR. DANG!I AM A HUGE SUPPORTER OF ALEC BALDWIN AND I FORGOT ALEC BALDWIN IMPRESSION OF HIM!IF I'M EVER IMITATED, THIS GAL HOPES IT'S BY HIM! KENDALL'S HAPPY BIRTHDAY MATCH GAME CARD, IS INCREDIBLY IMPRESSIVE!! !OBVIOUSLY THE ONLY FIANCE WORTH HAVING.ENJOYED OUR TALK! I will always remember the wonderful times we had with Charles at the beach house in Jupiter and the many wonderful dinners at Prego in Fort Lauderdale....He loved to go to the Poop Deck in Fort Lauderdale. One night he had the Hotel manager at The Marlin Beach open up the bar and a small group of us Marsha Mason and others danced the night away....He will be missed his funny jokes and singing opera...I was so lucky to have had the pleasure of knowing such a wonderful kind man. One day I will tell you how incredibly jealous I am that you knew all these people I idolized when I was a kid (wait a minute. I think I just did). He was hilarious and will definitely be missed. I always thought he had one of the best (and most distinctive) laughs in the world. Match Game - I never missed it. I still think of that show every time I hear the word "definitive"! The kids missed all this. All I have to do is hear Hello Dolly and I launch into that song, It Only Takes a Moment. Charles Nelson Reilly and Brett Somers are two voices from my childhood. We would spend the dog days of summer waiting for Matchgame and then marvel at how much fun they were having. This is a great tribute. Charles' wit and repartee will be sorely missed - from his oversized glasses and his choice of the hats/clothes that he chose to wear that were used to poke fun at the rest of the world, Charles was NEVER vicious with his comedic one liners. He ALWAYS acknowledged those people that contributed to his success. He was ALWAYS the consummate professional. Oft-times, he would set himself up for a return shot from one of the other stars that made up the panel. Charles, may you always enjoy center stage in heaven and may ALL of your one liners be winners and may you NEVER be stuck for a come-back. Thanks for the tribute Danny. I loved Charles Nelson Reilly. Growing up in Denver, we didn't get to see any Broadway shows so it was televsion, and "Match Game" was a staple at our house. It looked like such a fun party that I wanted to be invited to. His wit, and one-liners had me in stitches. I'll never forget "Lidsville" either, and those Bic Banana commercials. I sure hope is documentary comes out on DVD soon.